1. What are the approaches to whole-genome sequencing of pathogens? 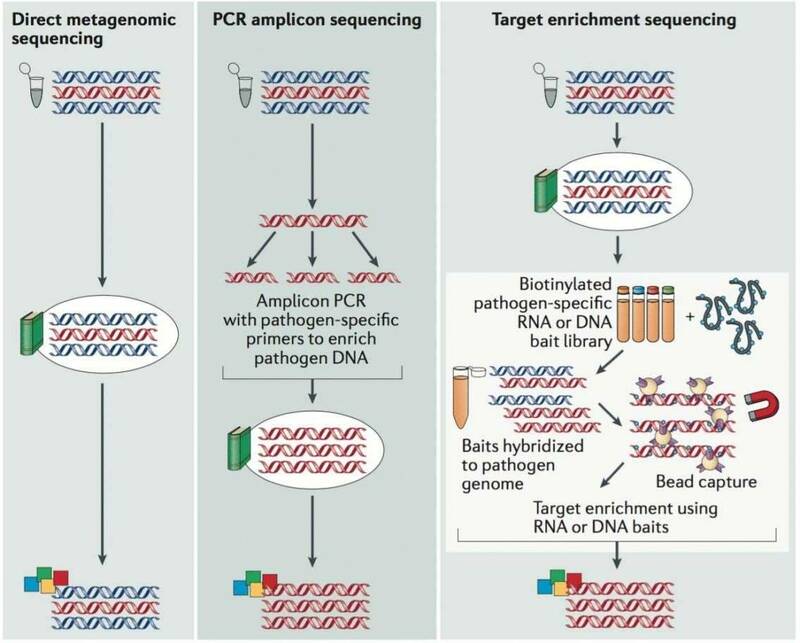 There are currently three main approaches to whole-genome sequencing of pathogens, i.e., metagenomic sequencing, PCR amplicon sequencing and target enrichment sequencing (Figure 1). Direct metagenomic sequencing provides an accurate and integrated representation of the sequences within a sample. PCR amplicon sequencing performs PCR reactions to enrich the viral genome, which substantially increases the workload for large genomes but reduces the costs. Target enrichment sequencing employs virus-specific nucleotide probes bound to a solid phase to enrich the viral genome in a single reaction, which decreases workload but increases the cost compared to PCR amplicon sequencing. The advantages and disadvantages are listed in Table 1. It shows that viral metagenomic sequencing has the unique advantages to investigate pathogen and characterize viral diversity in environmental and clinical samples. Figure 1. The main approaches used for viral genome sequencing (Houldcroft et al. 2016). Table 1. Advantages and disadvantages of different viral genome sequencing methods (Houldcroft et al. 2016). 2、What is the general bioinformatics pipeline for viral metagenomic sequencing? After sequencing, raw NGS reads are first preprocessed by the removal of adapter, low-quality, and low-complexity sequences, followed by computational subtraction of host-related reads. In a fast mode, viruses are identified by alignment to ViPR/IRD nucleotide DB. In a more sense mode, bacteria and related ribosomal RNA reads are removed before alignment to virus database. Unmatched reads are further aligned to a viral protein database (NCBI RefSeq DB). Then the taxonomy identification (Taxl), coverage plot (Covplot), de novo assembly (Multiple k-mer), and phylogenetic analysis (PhyGo) can be performed. 1. Houldcroft C J, Beale M A, Breuer J. Clinical and biological insights from viral genome sequencing. Nature Reviews Microbiology, 2017, 15(3): 183-192. 2. Li Y, Wang H, Nie K, et al. VIP: an integrated pipeline for metagenomics of virus identification and discovery. Scientific reports, 2016, 6.